The best parts of most cities are the spot where you feel like the pedestrian is winning over the car and bus, even if many “pedestrian zones” are nothing but open air shopping centres. It is true, for example, that you can drive your car alongside the Corniche in Beirut but the promenade along the sea-front is so wide and filled with walkers, joggers, food vendors, fishermen and cyclists that if you want a decent view out across the rocks and the water you’d better get out from behind the wheel and walk. Despite the new developments, Berlin’s Alexanderplatz still allows you to imagine its past as the socialist showpiece of the GDR and remains one of my favourite places in the city, and although cars run alongside La Rambla in Barcelona, it is the tree-lined walkway filled with kiosks, florists, mime-artists and the occasional hustler that dominates the scene. The vehicles seem almost incidental except when Barça win a game and the sound of celebratory horns fills the air. When I think of certain cities it is the public squares and spaces that I remember most, whether Red Square in Moscow, the Djemaa el Fna in Marrakech, or the Plaza Mayor in Salamanca. Whilst celebrating the liberation of public spaces in Europe’s cities, the Letter from Europe warns that there should be limits to how these spaces are also commercialised, whether through the spread of cafe terraces trying to make purchasing a coffee a necessary pre-requisite to enjoy a particular view, or the hawkers and portrait artists prowling the cobblestones. I would certainly agree with sentiment that “nurturing and cherishing a few non-commercial spaces in our cities is surely a mark of a civilised society,” but the recent Occupy protests in London and elsewhere have illuminated a further, and more dangerous threat to our “public” spaces – that of privatisation. “A defining characteristic of privately owned “public” squares and spaces is conditional access. Members of the public are only allowed in if the company controlling the place is agreeable. This is private property in the same way that someone’s house is private property, which means that the owner can decide who is or is not allowed to enter and what they are allowed to do there. This April is the 80th anniversary of the mass trespass of Kinder Scout, one of the iconic moments in the struggle to ensure the right to explore the natural wonders of the British Isles. It seems strange that the fight for access and a “right to roam” might one day be necessary to be allowed to walk, sit and protest unhindered on our city streets, and that the next mass trespass might not be a patch of rolling, beautiful countryside, but a platz, a piazza, or a square in the heart of a metropolis. You can subscribe to the wonderful Letter from Europe, as well as the magazine, on the Hidden Europe website. This entry was posted in Reflections on February 22, 2012 by Paul Scraton. 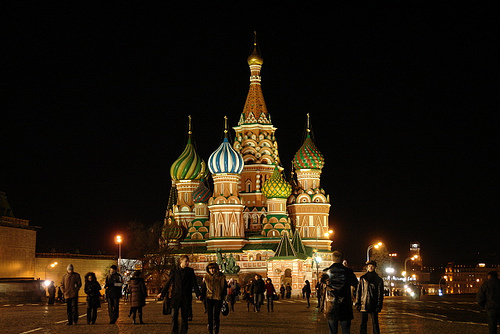 A bit ironic that you lead with a photo of St Basil’s Cathedral – when I visited Moscow in September 2010 I could not get access to Red Square during my entire stay in the city. The square had been cordoned off (and was heavily guarded by police) because of a high-profile international ‘tattoo’ being held there in the evenings. So no chance to pay my respects to Lenin’s tomb as this massive public space had been unapologetically commandeered by the powers that be. Good you mention the mass trespass of Kinder Scout in 1932 – a genuine class-war battle in which the workers, for once, actually won. It must have been a stirring sight to see groups of working men from Manchester and Sheffield coming together to confront the gamekeepers whilst singing the Red Flag and Internationale. Hi Laurence. Yes, the recent protests in Moscow were also on my mind when I chose the photograph… As for Kinder Scout, it was something that featured in the Wanderlust book that I wrote about a week or so ago, and I would love to be able to go and walk there sometime this year to personally mark the anniversary.